There’s a common assumption about music that major is happy and minor is sad. In today’s lesson we look at what this statement really means and perhaps more importantly, we examine how much of it is true and where it goes wrong. To help us along the way we have some great song examples – some of which will surprise you with their unexpected use of major and minor! Is Major Happy and Minor Sad? So What is ‘Major’ and ‘Minor’ in Music, Anyway? Major and Minor are Objective. ‘Happy’ and ‘Sad’ are Subjective. The terms ‘major’ and ‘minor’ describe the sound-quality (or sound-character) of intervals, chords, scales and keys. As we talk about in this lesson called “How to tell if the music is major and minor”, major and minor chords, scales and keys are very much related. To understand the major-minor labels, let’s start with the scales. As you know from music theory, a scale is a group of notes laid out from lowest to highest or highest to lowest. There are many types but the most common ones are these two 7-note scales known as major and minor. By ‘major’ and ‘minor’ musicians understand how the scales are built – we know what the specific pattern between the notes are. No matter which note we start on, the major scale pattern and the minor scale pattern are always the same. This is also why we need sharps and flats as they allow us to maintain the right pattern no matter which note a scale starts on. The major and minor scales have been, and still are, the basis of a lot of music we hear. Millions of pieces and songs have been composed using them. But are major scales ‘happier’ than minor ones? Without context we cannot really say. It’s just a group of notes played up and down. As we’ll see, it always depends on how they are used. The term ‘interval’ in music is simply the distance between any two notes. If I asked you, “What’s this interval?” I’m asking you to name the distance between two specific notes. By the quality (major, minor or other kinds). Now the question is, are minor intervals really sadder than the major ones? Let’s say we have this interval – a major third from C to E.
Now here is a minor third – it’s from C to E flat. You might be tempted to call the minor third the sad one, but now what if these same intervals are elaborated. What if we dressed them up with a few more notes to create a chord progression out of them? Is it still sad in this example? Whether or not we agree on how it makes us feel (if anything at all! ), I’m sure we can at least agree that a lot has changed. Once again this demonstrates that it’s all about context. Ok so let’s compare chords. Here is a major chord (G major to be exact) followed by its minor counterpart (G minor). Is G minor sadder than the major? I know we might be tempted to describe the minor chord as the sadder one. But what if the major chord is played way way down on the piano’s lowest keys. It’s not so uplifting any more, is it? The sound-qualities of major and minor are fixed and always the same. A major scale can be played fast, slow, loud, soft, high, low, on a piano or a trombone, in a big hall or a tiny room – it is always a major scale. That is to say the sound-quality is objective. But the way we react to major and minor music does depend on that context. As we’ve seen, a major chord played really low can be quite intense. A series of minor chords played quickly can sound rather uplifting. Our impressions and reactions to those sounds are subjective. So we keep running into the issue of context. That’s the key word here. There are just too many variables to reduce music to a simple toggle between ‘happy’ and ‘sad’. In music, context is everything. A note, a chord or a scale can have drastically different effects depending on how it is used. In 2013 Rolling Stone magazine polled its readers to pick the saddest songs of all time. Out of the top 10 saddest songs chosen, 7 are in major keys. Clearly, there is much more to music than just the key. Out of the top 10 saddest songs chosen, 7 are in major keys. Music cannot effectively be reduced to a simple switch between happy or sad. It is far more complex than that. We get nostalgic, hopeful, angry, scared, disappointed, grateful and a hundred other subtle feelings. And what about those moments where we don’t quite know how or what we are feeling? Music brings out all of these in its listeners. Not all music expresses any emotion at all. A composer can compose a theme, develop and vary it into a masterpiece without any extra-musical stories or specific feelings in mind. It’s music that exists purely for its own sake, for the enjoyment of listening. Emotions are subjective. Because people come from different backgrounds with different experiences, the same music can have drastically different reactions from them. If we get into the habit of imposing emotion-adjectives on music, we really take away from the experience of listening. We will also run into problems: If a major chord is always happy and a minor chord always sad, then what about a major 7th chord or minor 9th chord? What about diminished and augmented chords? What about music that is outside the major-minor system? So there is no need to assign a feeling to intervals, chords and scales. The best labels are the terms major and minor themselves because these describe the sound and they are objective. This song released in 2006 is probably one of the saddest songs I’ve ever heard even though it’s in D major. So what makes it sad? The progression will consist of 1 major chord and 1 minor chord. For a good while, we don’t get a clear dominant chord (in this case the A major chord) so the tonality remains somewhat uncertain. For example, the verse is mostly the chords D major and F sharp minor. The chorus is mostly the chords D major and B minor. In both sections, the dominant chord (that helps establish the key) takes a while to show up. The vocal melody contributes a lot to the song’s mood as well. In both the verse and the chorus, it tends to outline the interval of the minor third (between F sharp and A). First verse from ‘Hey There Delilah’ outlining the minor third between F sharp and A. In the 2013 Rolling Stone magazine poll I mentioned earlier, this song was voted one of the saddest songs of all time. However, it is undoubtedly in D major! Even the chord progression starts with a back and forth between the D major and G major chords. So what makes it sad? Tempo: For a radio song, Everybody Hurts is quite slow and that plays a significant part for the overall effect. The fragmented melody: The melody is sung in bits and pieces (from a few beats to 2 bars long). Having those spaces between verses makes it more introspective as if giving us time to process our emotions between thoughts. The shape of the melodic fragments is also notable: Throughout the song we often hear a leap followed by a short descent. This shape in combination with the tempo and the spaces in between creates quite a melancholic mood. We saw this technique of the fragmented melody in this lesson about Word Painting where the melody is cut up into short phrases to emulate crying. Link to song on YouTube. Written by Prince and released first in 1985, this is another immensely popular sad song. It’s key? F major! This is an interesting example because if we look at the chord progression and the melody with it, there’s nothing to suggest that it’s particularly sad. It begins with a long F major chord and continues a typical chord progression of I – V – vi (in this key that’s F major, C major and D minor 7th). So what makes it so emotional? Apart from the lyrics themselves, it’s the delivery by the singer. In the version by Sinead O’Connor, we can hear how her voice sometimes cracks, whispers, breathes heavily and cries (on the words “to you”). If this was arranged for orchestra or solo piano, it would be really difficult to capture these emotional vocal nuances. Compare the popular version here to this piano version here. Though the piano arrangement is well done and beautifully played, I suspect that it wouldn’t be nearly as emotional if we didn’t know the original. Everyone knows this hit from 2011 as a sad breakup song. But did you know it’s in the key of A major? So how can it be so sad? The shape and content of the melody. Just like we see in a few of these examples, the vocal line tends to have pauses after every few words. For example the first verse goes: “I heard” (slight pause), “that you’re” (slight pause), “settled down”. This is common (and appropriate) for introspective or melancholic songs. The chorus then features Adele’s powerful voice at its best. Like we saw with “Nothing Compares to You” earlier, the skillful performance transmits the emotion on the song. Once again, it would be really difficult to do the same on an instrumental arrangement of the same tune. While there are frequent hints of the relative minor key, the song is definitely in G major. So how can it sound so sad? It has similar characteristics to the other songs we’ve looked in this lesson so we don’t need to discuss them again. What is remarkable about this one is that the vocal line consists of melodic fragments that always descend. Coupled with the slow tempo these persistent descents makes the song sound sad. Perhaps a better word for the effect is of resignation or of giving up (“love hurts and there’s nothing we can do about it”). ‘Taps’ composed of just 3 notes that make up a major chord. As you can see in the notation above, it consists of only 3 different notes, the ones that make up a major chord. So how come it’s so serious and sad? And most importantly, we associate it with war, death and funerals. That’s context once again. Because of it, this melody is considered sad regardless of its musical major content. Wait, what? Pharrell Williams’s mega hit is in a minor key? So what makes it ‘happy’? 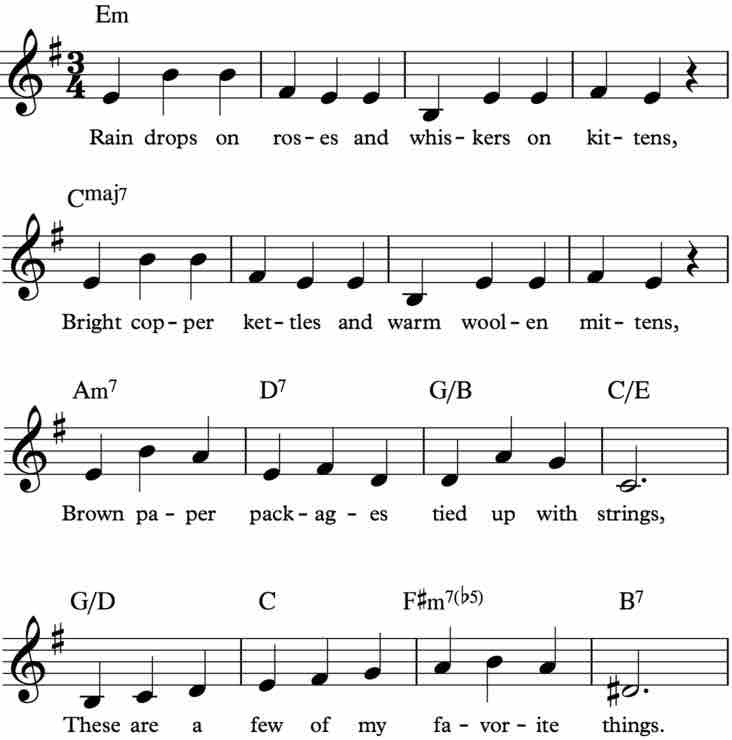 Despite the overall key, the song begins with the chord of F7 (F – A – C – E flat) immediately setting up the right mood. The scale used is the natural minor scale (known also as the Aeolian mode). As we speak about in this lesson about minor scales, the natural minor scale (with the 7th raised a step), scale softens the ascent to the tonic minor compared to the harmonic minor scale. But most of all it’s the rhythms. The rhythms are quick, fun and infectious. Think about the bass line and the clapping during the chorus or the backing ‘yeahs’, for just a few examples. This popular tune from the Sound of Music is in E minor. So what makes it ‘happy’? Once again, the rhythm plays a crucial role as the quick tempo helps produce a good mood. What’s really interesting, however, is that despite the overall key of E minor, the chord progression features very few minor chords. For example the first verse is 16 bars long: the first 4 consist of an E minor but after that it’s all major chords except for 2 bars. In addition, notice that when the chord is E minor, the melody completely avoids the note G. That’s the note that would give E minor its minor quality (because that’s the note that makes it different from E major, which would have a G sharp instead). Its absence is significant! This song is clearly in A minor. Not only does it begin on the chord of A minor but the consistent raised 7th (the note G becomes G sharp) pushes the notes towards a definite tonic on the note A. However, I don’t get even a hint of sadness. This is subjective, of course, but if I had to describe it I’d say the music is great to dance to while the lyrics express frustration. This makes the point from earlier: music doesn’t have to express some specific feeling/s, but even if it did, there are many others than merely happy and sad. There are many subtleties that makes this song what it is but first and foremost, it’s the quick tempo. We’ve seen all throughout this lesson that tempo has a greater effect on whether a piece is happy or sad than keys and chords have. In some ways this song reminds me of Mozart’s Turkish March from his Piano Sonata no. 11. That piece is also in A minor, quick and every section builds off of the last giving it a great sense of cohesion and direction at the same time. These attributes have a greater effect on its emotional content than whether the key is major or minor. While the bass line of this well-known song suggests the key of A minor, the song is not sad at all. As its name suggests, it’s more about passion. As you listen to the song notice that all throughout the vocal melody avoids the notes B and F reducing the scale to the A minor pentatonic. This together with the slightly swung rhythm gives it a hint of blues. The performance is smooth and perhaps somewhat seductive. However we describe it, I’d find it hard to say that it’s a sad song despite the minor scale. If we learned only one thing from today’s lesson, it has to be this: major doesn’t automatically mean ‘happy music’ and minor doesn’t automatically suggest ‘sad music’. If major is ‘happy’ and minor is ‘sad’, it is true only to a very limited extent. It is true only in isolation. When a minor chord is placed within a progression, it can all change. Tempo, timbre, rhythm, melody and other musical attributes have a greater impact on the overall effect of a piece. The color red has different meanings to us depending on when, where and how it is used. On Valentine’s day it symbolizes passion and love but in a war movie it means blood and pain. White flowers can suggest the happiness of a wedding but also the sadness of a funeral. It’s all about the context, the subtleties and the nuances. Everything in music and what it means to people is determined by the subtle details within the notes. It’s the context that makes it what it is. It’s all about how the musical features we explored today (like the rhythms, tempos, chords, performance and instrumentation) interact with each other.